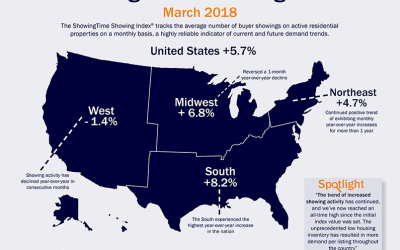 Showing activity across the U.S. increased 5.7 percent in March to reach its highest point in the four years the ShowingTime Showing Index® has documented buyer demand. 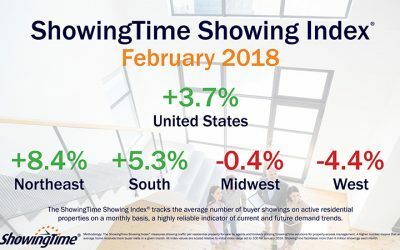 Home showings on the national level posted a 3.7 percent year-over-year increase in February, according to the ShowingTime Showing Index®. The ShowingTime Showing Index® revealed that home showings on the national level posted a 5.2 percent year-over-year increase in January as 2017’s high consumer demand continued into the new year. Here’s a closer look at some of the features we enhanced and the products we developed in 2017. Home showings on the national level posted a 7 percent year-over-year increase in December 2017 to close a year in which showing activity increased 8.5 percent nationally, according to the ShowingTime Showing Index®.